En Passant are French words translated in English as "in passing." It is a special move in chess and probably the last rule you will learn before you've mastered the moves. It is important to know this rule properly as many players claiming to know the rules of chess may give you a strange look when you play it in a game. This rule must be honored in every chess game since it's part of the basic rules of chess. Lastly, this rule is not called "pass pawn" even though you may hear some people describe it in this way. First, one can only capture Pawns en passant. En passant occurs only when your pawn is resting on the opponent's 5th rank… each player counts up five ranks from his side of the board. In Diagram #1, white has a pawn on e5 and black moves his Pawn two squares to f5. 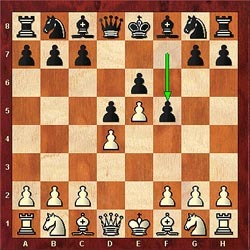 White now has the option of capturing the black Pawn en passant (Diagram #2) as if it had only moved one square (to f6). 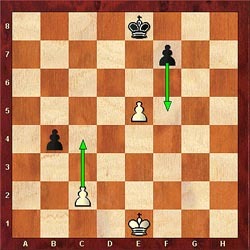 White is not obligated to capture en passant and could also play another move like moving one of his minor pieces. However, you can only capture en passant immediately after your opponent gives you the chance, or the opportunity is lost until the next occurrence. Got it? 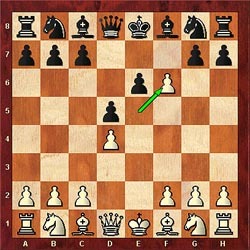 Remember… your opponent has to move TWO squares to pass your pawn on the 5th rank.